Imagine a session band escaping from the psycho ward, commandeering a steamroller up & down the interstate, plugging in and turning up to eleven, all the while raving about thistles and shamrocks floating to the shores of America. This is Na’Bodach! Billed as a “five man, high octane Celtic band” they have been playing to packed houses and festivals throughout the Eastern US! 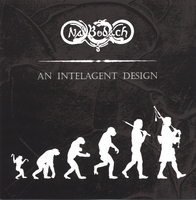 Also on Celtboy Records: Na'Bodach "Knickers Down, Bottoms Up" & Andy Redmond "Kilted Warriors"
An Intelagent Design is addictive... it's the only thing I've played in my car since receiving it... esp. since seeing them on St. Patty's Day at Kenny's... imagine singing the Cuckoo's Nest in your head while in a corporate meeting... the irreverent humor knocks my socks off... I am going to purchase a few more CD's for my family and friends... And, CD Baby rocks... they have stock and a great price... Nabodach, not your average Celtic band... these guys are GGrrreat! Quite possibly the most unique and interesting Celtic album ever! No other band sounds like Na'Bodach. This album should live on to become a classic of the genre. Why they are not more recognized is a mystery. Keep recording, lads! Na'Bodach is, quite simply, the best Celtic band around. INTELAGENT DESIGN is great - in tandem with KNICKERS DOWN, BOTTOMS UP and a few pints of Guinness, you got yourself hours of good music and good stout. Only thing better: seeing Na'Bodach live. I got their CD at the release party, and man oh man. If you like Knickers Down, this is a MUST HAVE. If their first album was like finding your favorite pair of pants after they've been missing for a month, then this album is like finding your favorite pair of pants, with $100 in the pocket. BUY IT, keep the angry walrus off your lawn!